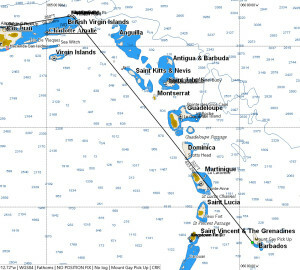 The course of the Caribbean Rum Run stretches from the Barbados in the east to Cancun in the west. While the an aggregate rhumb-line of the race almost 1800 nm – much longer when measuring ‘on the water’ distance — it is convenient to look at the run as a series of short races. Each of these short races acts on the SOL fleet like a filter. Each filter presents a different challenge. 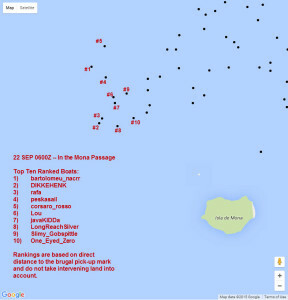 The first challenge is passing through the Windwards Islands. 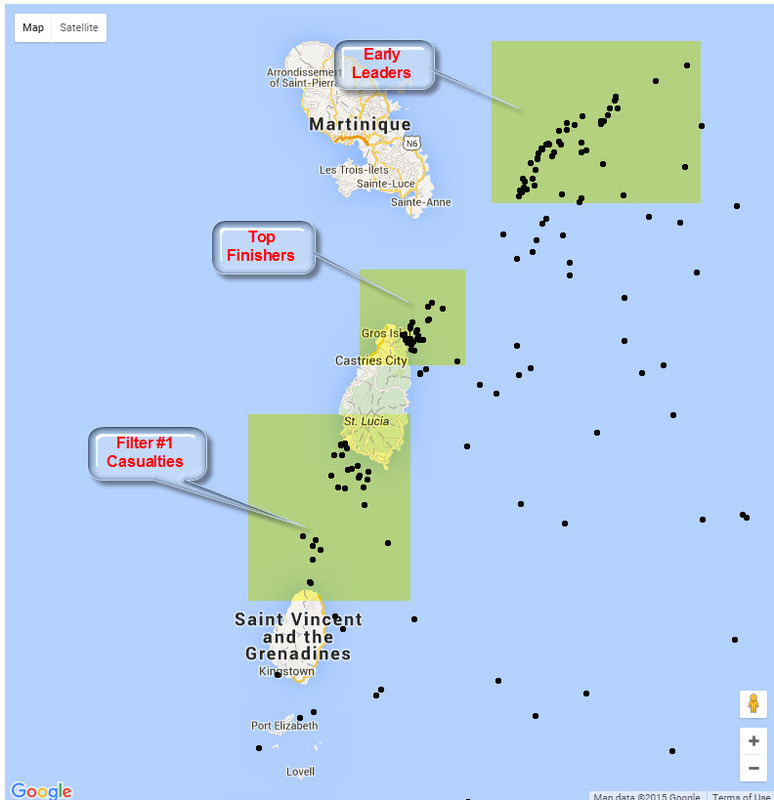 Filter #1 is the question of where you pass through the Windward Islands from the Atlantic to the Caribbean Sea. The rhumb-line would leave Martinique to port and Dominica to starboard. Stronger winds to the east have tempted many in past races to go ‘over the top’ of the Windwards. I have never seen that work. Winds this year put us on a downwind leg from the start. My routing software suggested, pre-start, leaving Sta Lucia to starboard. First of all I was glad to be in the pack of five boats I found myself. The other four were all good skippers. Rafa, in particular, has been a guiding light for me since my very first SOL race. Second, I wondered if DIKKEHENK’s northerly position would be a problem. 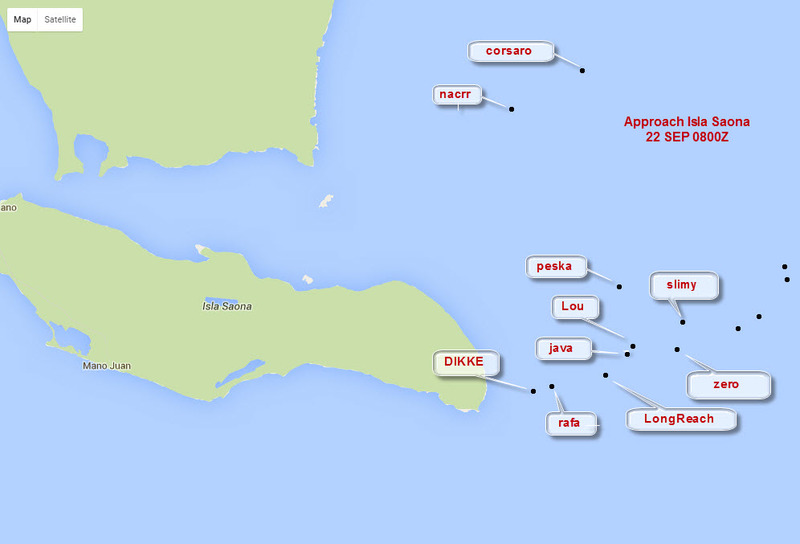 And, by the way, how did he manage to get there?DIKKEHENK has been sailing very well in the last few months. He is in contention in every race he enters. That has earned him a permanent place on my watch list. 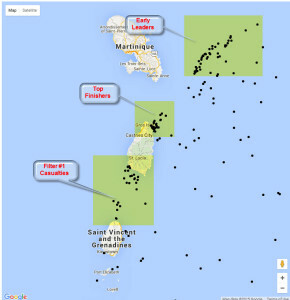 In past years the northern coasts of Anegada and Puerto Rico have acted as filters. Not so this year. Following the best winds took us north of both islands — except for a quick swing south for the Bacardi Pick-up. The three “pick-up” marks act as both choke points and filters. 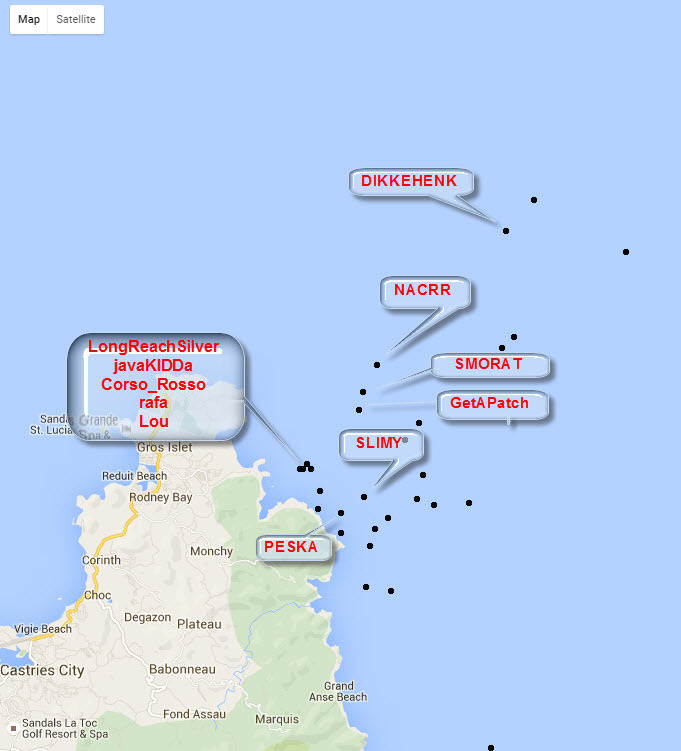 Choke points because their inshore location dictates they be passed close-aboard. That forces folks to get in a line. Filters because, with the shore that close, the possibilities for BBQs abound. But Isla Saona, at the southwest end of the Dominican Republic, is often a key filter for the fleet. This year, initial routings showed the inside passage to be about 4 minutes quicker than leaving Saona to starboard. That changed, in my software, with the 0430Z WX. Going south (outside) of Isla Saona was now showing as clearly favored. I am embarrassed to admit that, ‘in error’, I had routed south of Saona prior to the WX. When the new winds came, it looked like I was prescient. The truth is, I was lucky. 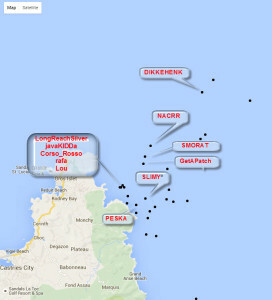 The WX sent some boats (peskasail looked like one) scrambling toward the south. 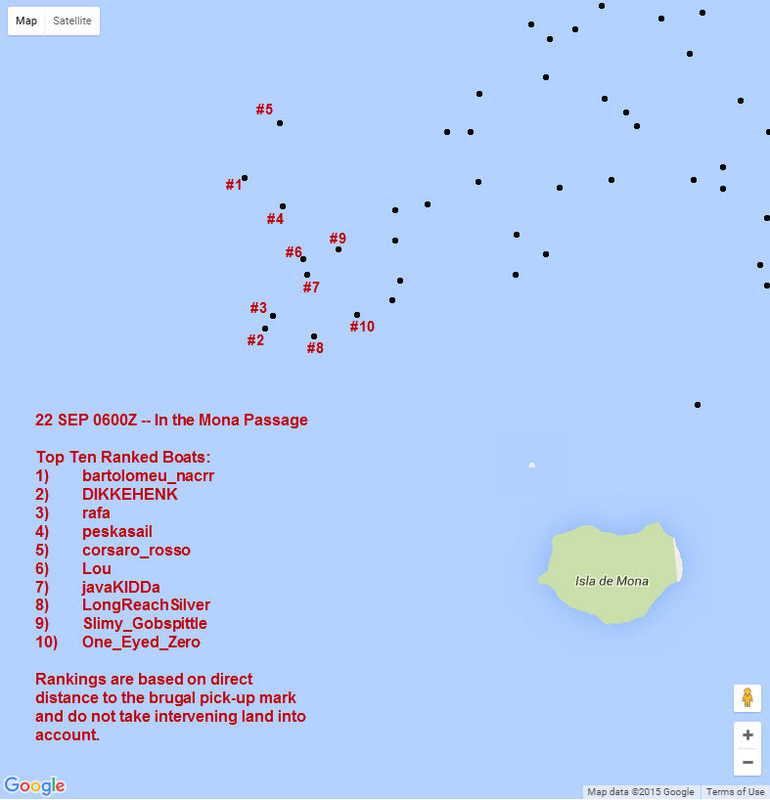 However Bartolomeu_nacrr and corsaro_rosso were north of the fleet. They remained committed to the inside passage. And that cost them their podium chances. 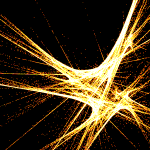 Brugal filtered out Slimy_gobspittle on a rounding event. Leaving Brugal, javaKIDDa was in a race with the other three boats for the final podium position. – gybing back north toward the Appleton Pick-up mark. 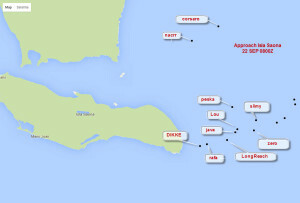 JavaKIDDa traded VMG for speed and reached the stronger winds sooner than Peska and LongReach. Bartolomeu_nacrr missed the Appleton mark and went on to BBQ — taking him out of podium contention. In the final leg, javaKIDDa was able to convert a covering position over Peska and LongReach into the final podium slot.